The first time we crossed the border into Chile from Boliva was in the very northeast corner. As we were riding south towards Ushuaia we were criss crossing the borders between Chile, Argentina and Bolivia eight times so sometimes when we woke up we asked each other which country we were in. Chile is a long, narrow beautiful country stretching along South America’s western edge, with more than 6,000km of Pacific Ocean coastline. Just short after we crossed the border into Chile we saw Lago Chungara (photo below) and we knew straight away that we were going to love this country. The first stop in Chile was in the city Arica, which lies along the Pacific coast. Here we met the super nice couple Daniel and Polly from the UK on a campsite. They where dressed in a ”Tintin” style and rode two up on an old BMW R80 Dakar… cool. Just outside Arica we came across a dog cemetery where a vulture sat on a gravestone for a dog. We rode through three wonderful National Parks in the very north of Chile, Lauca National Park, Las Vicuñas National Reserve and Volcán Isluga National Park. During these days we only saw one car. Lucky us, we found some shade from the very intense sun where we could cook some lunch. Increadable that flamingos like to be in this cold climate, This on altitude 4300 m.
After a very long day riding on some challenging dirt roads we thought that we had found the perfect place, next to a hot spring at 4,300 m altitude, to pitch the tent. However, in the middle of the night the wind turned and it smelled like.. egg fart… yuk!!…. It was freezing cold and the bottles of water we had in the tent had frozen, so there we were without drinking water in a fart smelling tent freezing our butts off. We saw lots of lamas and a little one, probably just a day old, thought we were its parents. It was so cute and when we left he run after us on shaky legs… I was in tears… I hate goodbyes. Shortly after the third border crossing into Chile, about 150 km northwest of Santiago, we came across a very nice switchback road. We did of course arrive late to this lovely road with a lot of hairpin turns. Oh yes, our planning is not the best and we ended up riding in the dark again. However, just after this road we found an abandoned house where we could pitch the tent. Next morning we rode up this road again to be able to take some photos. We stayed at Hostal Casa Matte in Santiago and met a lots of friends, both old and new. 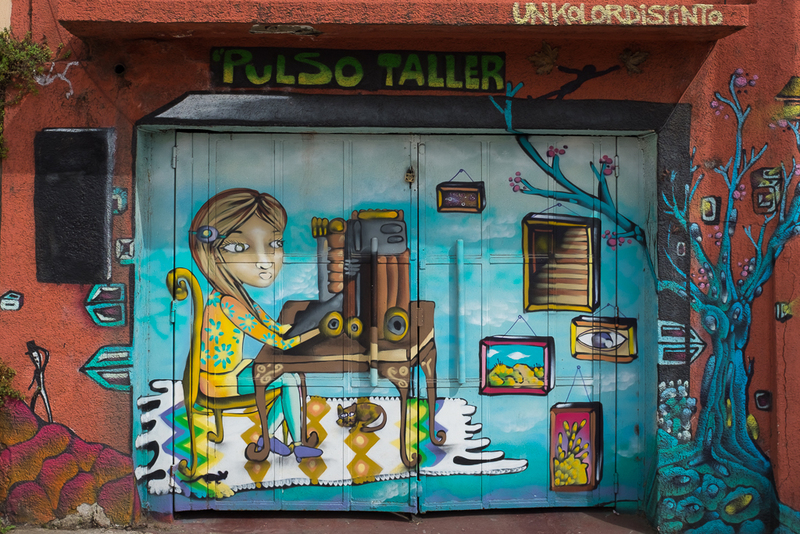 We both love graffiti and Valparaiso is the perfect place to see some great artwork and to stay and chill out. 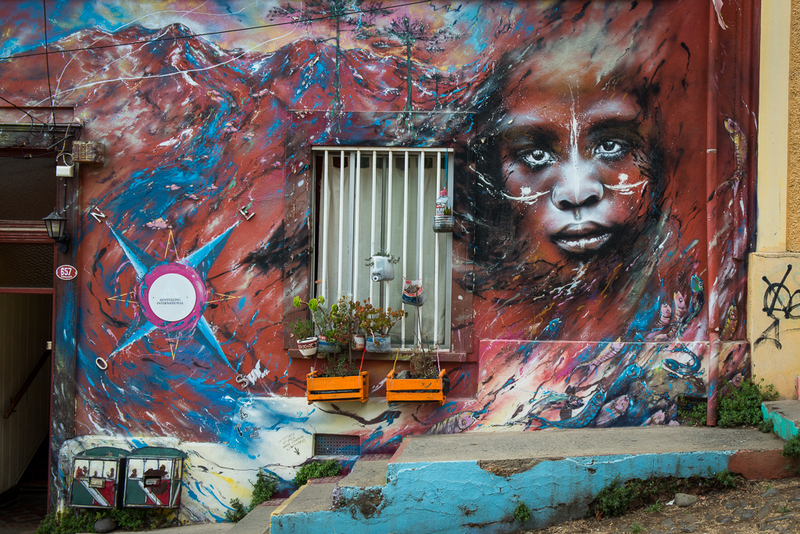 Valparaiso is a city on the shore that has bright coloured houses with beautiful seaside views and there are plenty of magnificent graffiti to look at when strolling around on the hillside. We loved Valparaiso and would have loved to stay longer, but we had to keep going so we could reach Ushuaia, in south of Patagonia, before it became too cold. This little grey dog did not move whatever we did.. we later found out that it was blind and deaf and the other dog looked after it. It is not very often that we have met Swedish adventurer during our over three years on the road but in Puerto Varas we met Roberto and Christian who were riding in the opposite direction. Very nice guys. Just before Isla Grande de Chiloe our bikes had done 100,000 km… quite a ride we started three years earlier. 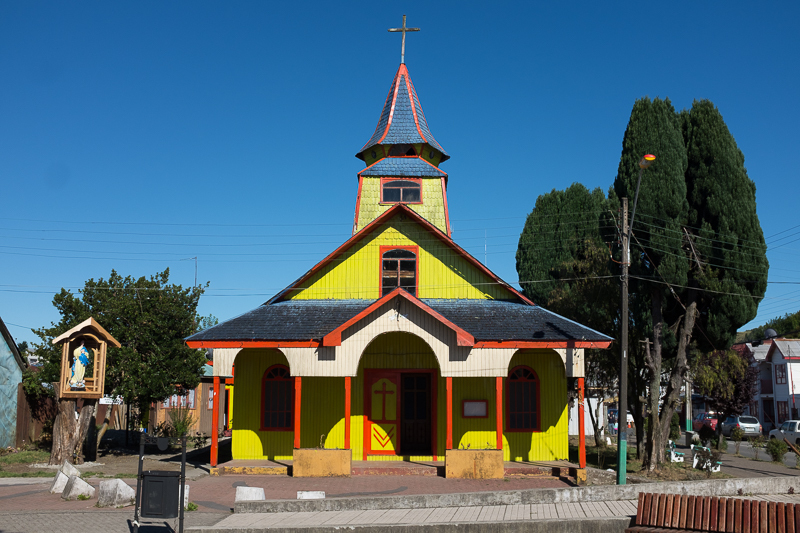 Isla Grande de Chiloe is the main island in the archipelago. The island is known for its iconic wooden churches built by Jesuit missionaries in the 17th and 18th centuries. We did a hike up to the Three Towers. OMG what a strenuous hike that was. The walk back, downhill… almost killed our unfit legs and knees. However, it was worth every step to see the Three Tower and luckily the clouds cleared up a bit so we could get a photo. The Carretera Austral, Route 7, in Chile is definitely one of our favourite roads in Chile, with its 1,200 km long route through pristine landscapes of natural beauty. In Chaiten we had a bit of bad luck with our gadgets. My (Petra) MacBook died… my battery to the mobile phone died, my satnav started to malfunctioning. Add to that, my ABS and heated grips were broken, the gloves starts to fall apart, the 24-70mm zoom lens had broken down and my boots were seriously leaking (big holes), etc. Despite of that, I think everything was fine… and with the fantastic dirt roads and scenery it still felt like we were the lucky ones. We had a fantastic time in Chile and hope that we can come back one day in the future. I wanted to click on like but it doesn’t open. Be sure, like is not enough!